Missoni seems to have its finger in a few pies these days, but it was only a matter of time before the label joined forces with Bric's. The Missoni family has a long history with Bric's founders, the Briccolas, so it seems only natural that they'd eventually create an accessories collection together. The bodies of each bag is made from either zig zag printed PVC or water-proofed nylon. These cheaper materials are then dressed up with leather logos. And as they're made in Italy, they've got superior craftsmanship even if they're not made with superior fabrics. 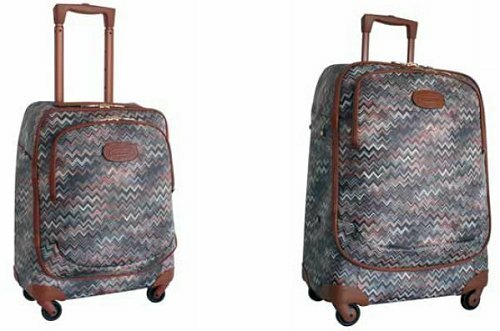 The PVC luggage line features a pair of soft travel bags, two necessaires, a wheeled duffle bag, a laptop case, and a trio of differently sized trolleys. The nylon range offers two shoulder travel bags with double handles, a vanity bag, a collapsible shopper, and pair of trolleys. Each style is available in a selection of colors. I particularly like the blue and pink versions, but traditionalists will be likely to appreciate the more sedate brown and black alternatives. The PVC range will start selling at Missoni boutiques, Bric's stores, and selected specialist outlets this December. The nylon luggage line will join it in the same boutiques next spring.